Two platforms still in use with buildings on both of them. 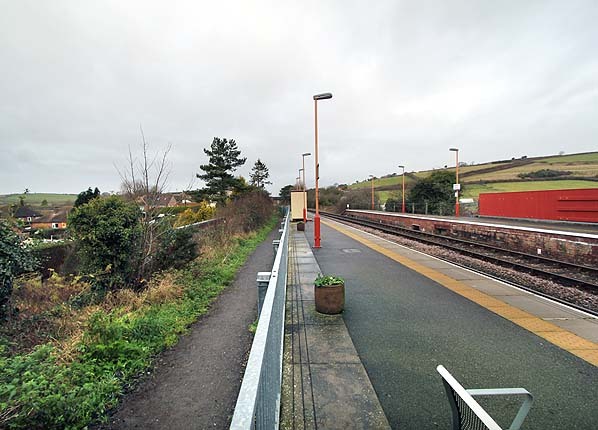 The Bridport branch platform survives although the track bed has been filled up to platform level and now carries a public footpath. The short goods dock also survives. Although now out of use the signal box is extant. Notes: Maiden Newton station was opened on 20 January 1857 by the Wilts, Somerset & Weymouth Railway with the section of their broad gauge single-track route from Yeovil Pen Mill to Weymouth. This completed their main line from Chippenham to Weymouth, the first part of which had opened in 1848. The railway was a part of the larger Great Western Railway which meant that through trains ran from London Paddington station. roof and short canopy over the entrance to the waiting area. 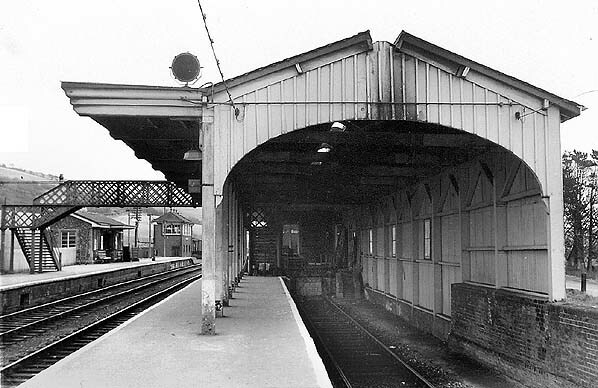 The footbridge, midway along platform, was of lattice construction, which was an unusual feature on a GWR line. The stationmaster’s house was north-west of the station, beyond the occupation road underbridge. The engine shed and water tank were located in sidings NW of station; the engine shed is no longer shown on the OS map of 1902. There was a goods shed at the south end which contained an island platform with a single track one side and covered road access on the other. Cattle pens were added on short spur immediately southeast of Yeovil-bound platform. A coal siding ended at the south-east end of the down platform, and a further siding extended behind this platform. 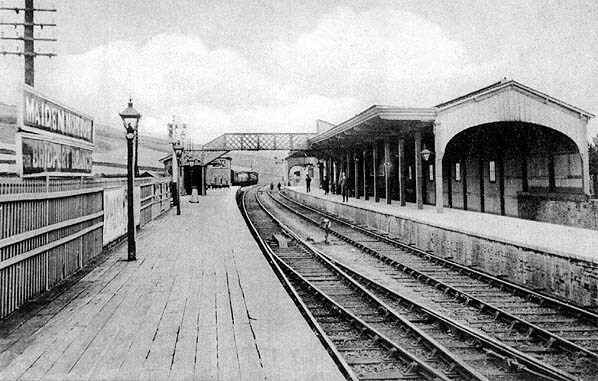 A signal box was provided on the down (Dorchester-bound) platform immediately south-east of the waiting shed, but this was replaced by 1925 with a new box immediately south-east of the same platform. In 1938 (summer) the signal box was open from 6.00 am (Mondays), 5.30 am (other days) until 6.00 am the following Sunday, reopening the same morning at 9.30 am and closing at 10.30 pm. The box was provided with a switch. After passengers had stepped from the branch train, the engine pushed the coaches, usually a B-set, to a gravity siding. Here the engine uncoupled and ran into another siding, then the coach brakes were released allowing the vehicles to gravitate to the platform. Finally the engine could emerge from the siding and couple on for the next working. By the 1950s the platforms lit by electricity using concrete standards, which were favoured by the Southern Railway, but were also used at some GWR stations. Green totem name signs were installed during the period of Southern Region administration. On 20 December 1963 the down siding adjacent to the main line was lifted. In September 1967 the other down siding became redundant, and in the following years the layout was trimmed until only the main line (which had been singled on 26 May 1968) and the branch remained. 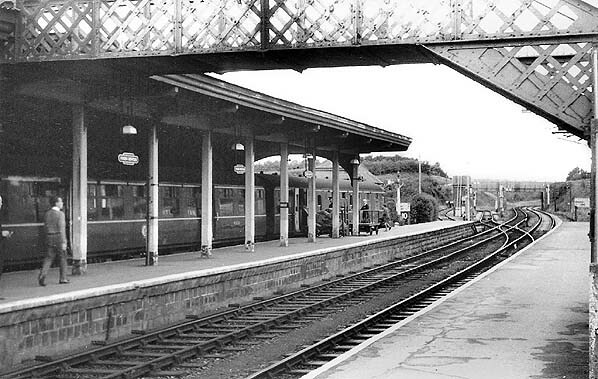 The trainshed over the Bridport platform was removed in 1967 or 1968. A 1972-3 OS map indicates that the goods shed and cattle pens had gone and that the sidings had been simplified. In 2012 Maiden Newton station is unstaffed and enjoys a service of eight trains in each direction on weekdays and five on Sundays. 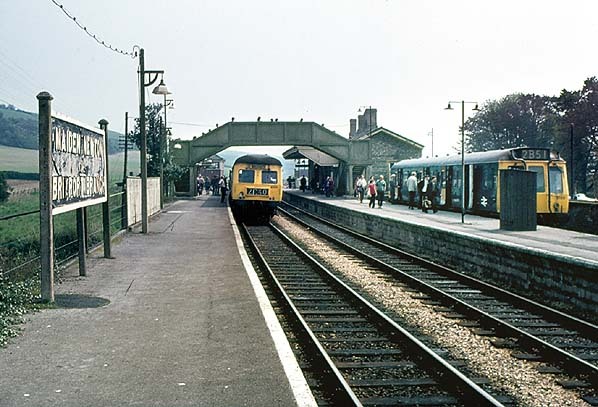 Maiden Newton station starred in the second episode of the third series of To the Manor Born, the comedy featuring Penelope Keith and Peter Bowles, which is supposed to be based somewhere near Taunton. In this 1981 programme Maiden Newton station is renamed 'Marlbury' - some Corporate Identity nameplates in capitals with this name are strategically placed on it. The episode concerns the proposed closure of the station, and the fight to save it is led by Audrey fforbes-Hamilton (Penelope Keith), while Richard DeVere (Peter Bowles), the Lord of the Manor, plans to use the station site for a Cavendish Food's cash-and-carry supermarket. The keen-eyed will observe that in the closing moments of the episode a 'Maiden Newton' sign affixed to a lamp standard makes an unintended appearance! It is ironic that the site of the Bridport terminus did end up in the ownership of a supermarket! When the line opened the only intermediate station was Powerstock, whose name was ‘Poorstock’ in most sources (including GWR timetable and Bradshaw) until 1860. The station building was in the style of a cottage, which could be used as a dwelling if the station did not pay. On 31 March 1862 a further station was opened at Toller Porcorum – known, simply, as Toller – and this was also an inexpensive structure. The intention was to provide a passing place at Powerstock but this was never installed, and, throughout the life of the branch, trains could cross only at the Toller goods loop, operated by a key on the electric train staff. Diesel multiple units replaced steam traction on 15 June 1959; on the same day the single-road engine shed at Bridport closed. At first a 3-car DMU set was used, but later a single-car unit was found sufficient. 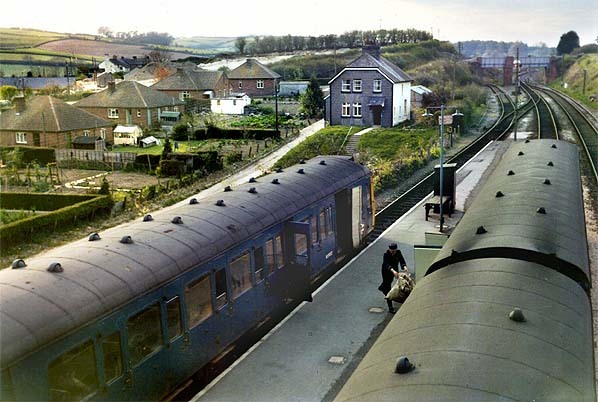 In winter 1960-1 the down service (Maiden Newton – Bridport) consisted of ten trains on weekdays and 4 on Sundays. In the opposite direction, in addition to the ten weekday trains an extra late working on Thursdays and Saturdays left Bridport at 9.05 pm, and there were three trains on Sundays. Sunday services ceased in 1962. The DMU came daily from Weymouth, and when that shed closed in 1968, the working was covered by Westbury depot. If it lost its path on the single line and was late arriving, a taxi had to be substituted. Following the dieselisation of the passenger service, goods trains continued to be worked by 57XX class 0-6-0PTs and latterly Ivatt class 2 2-6-2Ts until this traffic ceased on 5 April 1965. From this date the branch was operated as a single line siding, the only signals being at Maiden Newton. was unstaffed from 6 Oct 1969. The May 1974 timetable showed nine trains in each direction on the branch. Part of the trackbed between Bridport and West Bay is adopted by the A35 Bridport bypass (Sea Road South). The West Bay section between Burton Road and the station itself is a gravelled footpath which rises to meet Burton Road. The top of the bridge, bore entrance and track bed can still be identified. Towards the site of East Street station, the railway would have passed through Wanderwell and then east of the unction with Burton Road and West Bay Road. Sea Road North uses the former trackbed between East Street and Bradpole Road stations. Tickets from Michael Stewart. Brian Halford. Bradshaw and BR timetable from Chris Totty . Route map drawn by Alan Young. Maiden Newton looking south-east in 1906. The Bridport branch bay platform has a wooden trainshed of generous proportions, with an awning to shelter the northbound through platform. The iron lattice footbridge, later replaced with one in concrete, connects the platforms. 1902 1:2,500 OS map.The station is in a rural location north-east of the village. The Bridport branch diverges to the west of the Weymouth – Yeovil line at the northern edge of the map. The slip siding can be seen to the left of the branch. Maiden Newton station’s substantial main building is at the head of the approach road. The waiting shelter and signal box can be seen on the eastern platform, and the footbridge is also in place. The goods shed, cattle pens and accompanying sidings are located to the south-east of the passenger station. 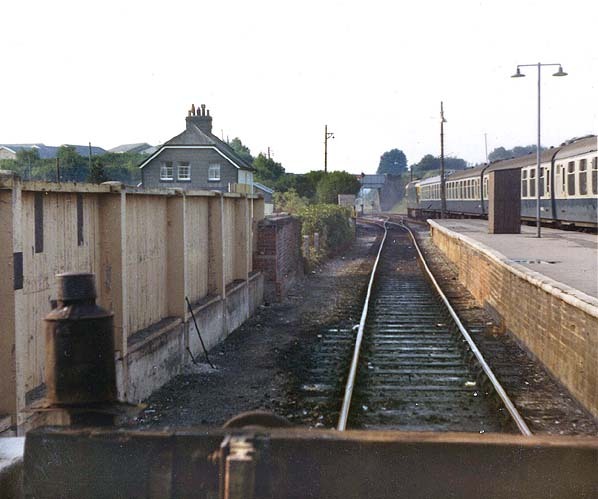 Maiden Newton station looking south-east in the early 1960s. The timber trainshed on the right shelters the Bridport bay platform and obscures the station building. 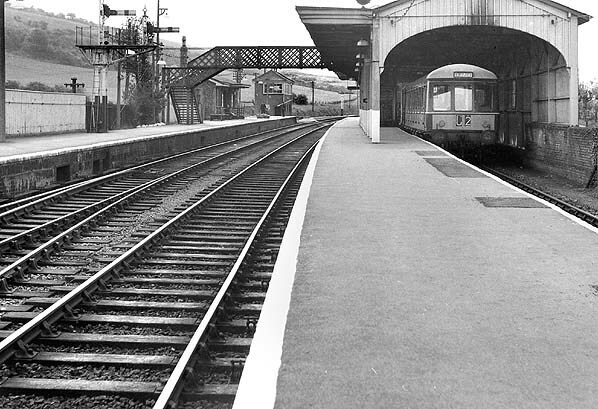 Maiden Newton looking west from the southbound platform in August 1963. A DMU is at the bay platform beneath the trainshed. Note the lamps and totem name signs installed between 1950 and the end of 1962 when the station was administered by BR Southern Region. 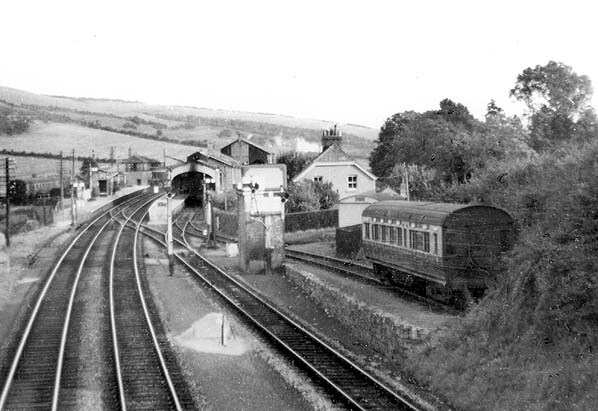 The Bridport bay platform at Maiden Newton looking south-east in the 1960s. This useful view provides internal detail of the trainshed, which survived until 1967/8. 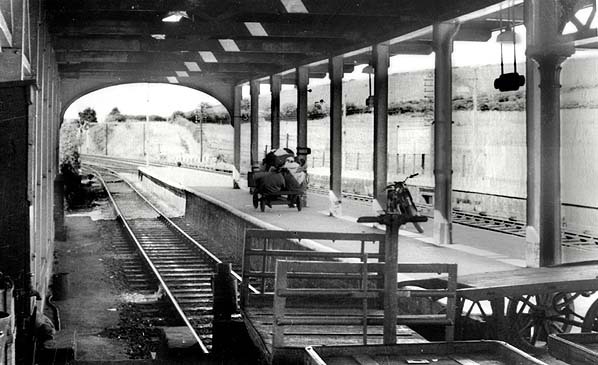 Looking north-west under the timber trainshed of Maiden Newton station in the 1960s. This view allows the internal structure of the trainshed to be examined. The heavily laden trolley on the platform will be noted. The trainshed was demolished in 1967/8. Maiden Newton looking south-east from the road bridge in March 1965. The Bridport branch is seen diverging to the right from the main line. The gravity siding is seen on the right. An incoming train would back into the siding after passengers had disembarked. The engine uncoupled and ran into another siding, then the coach brakes were released allowing the vehicles to gravitate to the platform. 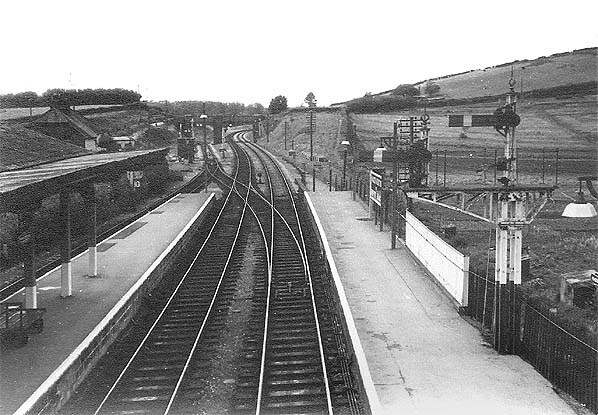 Looking north-west from the footbridge at Maiden Newton in May 1967. The Bridport bay platform is covered by a trainshed. The branch to Bridport passes under the left section of the distant road bridge before heading westwards. 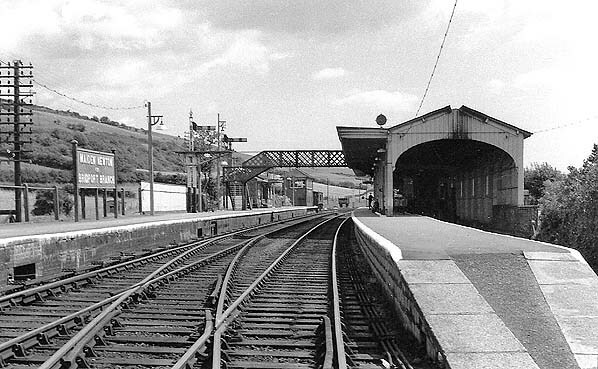 Looking north from the buffer stop at the end of the Bridport bay platform in 1972. The timber trainshed was removed 1967/8 although a section of the supporting wooden wall can be seen on the left. 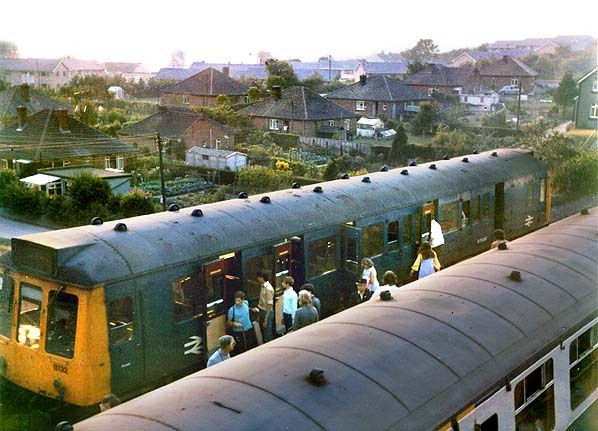 A busy scene at Maiden Newton station in 1972. A Bridport train stands in the bay platform while a northbound (towards Yeovil) train is loaded with mail on the main line up platform. The stationmaster's house is seen alongside the track. Looking north from the Bridport bay platform in December 2011. The platform edge can still clearly be seen, but the trackbed has been infilled up to platform level and now carries a public footpath.